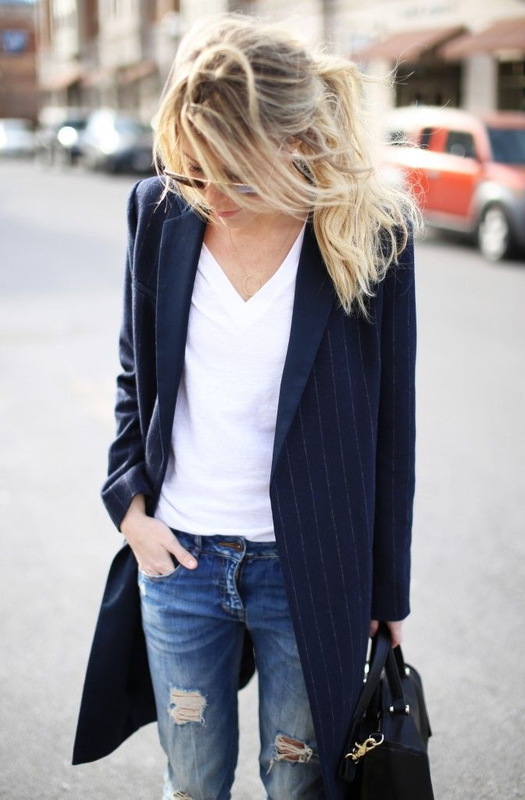 If there is something versatile and easy to style, then it’s a blazer. Today’s post is dedicated to all my favorite smart-casual outfit ideas completed with blazers. I know many ladies who are confused on how to wear this beautiful topper in their everyday lives. Thankfully, there are lots of inspirational street style images to get inspired by and see the best ways how to create amazing smart-casual outfits with blazers. Metallic gold blazer looks terrific worn with black T-shirt, black leather skinnies and cuffed black heeled sandals. Complete this look by adding a spacious tote bag made of black leather. Thanks to modern designer brands we can try on all kinds of suit jackets, including the one that hit a bit lower your hips, boxy Tomboy styles, cropped versions, polished, shiny, neon colored, office styles, nautical inspired, military, printed, etc. What I am trying to say is that it’s time for us to start sporting refreshingly chic outfits that are versatile, easy to style and wear. Ahead, 18 fresh outfit ideas to breathe new life into your everyday looks.